In my previous post “Seven Steps to Writing Effective Statements of Work – Intro” , I provided a high level overview of the Statement of Work (SOW) development process. In this post, I cover step 1 – planning the effort. Start the SOW writing process by identifying and capturing in a document the high- level objectives or purpose of the SOW. At this point, you will not have enough information, so make sure that you collect all the different ideas that the stakeholders have about the outcome of the project. As you talk to your stakeholders, ask questions whose answers will give you a sense of the magnitude of the work to be performed. It is critical to also define what work is not part of the SOW. This information will eventually be refined and included in the “Scope of Work” section of the SOW document, which will be covered later in this document. 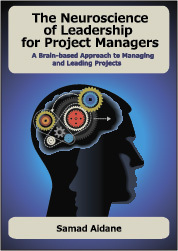 You should also collect background information that will help you clarify the needs that the project must satisfy. If your organization uses business cases or other documents to justify projects and secure funding, then review these documents for background information. An introduction or background, or both, is preferred. The background information should be limited to only the information relevant to the purpose of the SOW. A brief statement of what the SOW should cover. The development of a high-quality SOW is the result of a team effort. Identify all departments and subject matter experts who will participate in the preparation and review of the SOW and determine the participants’ areas of responsibility. There are no hard or fast rules on who needs to participate. The only rule is that anyone, who might at some point use their power to derail the SOW process, should be represented on the SOW team or given a chance to review and approve it before the final SOW version is approved. Tip: In a highly complex project involving multiple departments or divisions with conflicting interests and priorities, it is tempting to try to save time by starting work on the SOW before you assemble your team. However, there is always the risk that the new people who join the project in later phases will challenge choices and decisions made previously. This allows them to say that because they were not involved in prior decisions, they are not responsible for their outcomes. So go slowly initially so that you can move faster later on. Be sure to involve all key stakeholders before you start any serious work. The ideal team should include members of the departments or divisions who will be impacted by the outcome of the project, subject matter experts, and supporting departments such as accounting, procurement, and legal. The SOW development team leader (most likely you) who has the authority and responsibility for developing the SOW. The functional and technical subject matter experts who will provide domain knowledge to describe the work to be done and its acceptance criteria. Other supporting subject matter experts in areas such as legal, accounting, and purchasing, who will provide the necessary review and guidance. It is critical that you identify anyone who has final review and approval authority over the final vendor SOW. Obtain their requirement at this stage so they don’t surprise or delay you down the road. if possible, come up with an initial timeline to complete the SOW. Project Sponsor Meet with SOW team leader frequently to monitor progress, give guidance, and provide liaison to customers. Review the SOW at planned review points and provide input and guidance. Review final SOW and provide final comments before final approval. Meet with the SOW team as needed to provide guidance and support for its efforts. Project Manager Oversee the SOW team. Assign tasks to team members as needed. Monitor progress of the SOW team. Coordinate review by stakeholders and management. Conduct team meetings as needed to review work completed, assign new tasks, and respond to questions from the team. Contract Management Assist team in the development of the SOW. Coordinate the legal and purchasing departments’ review of the SOW. Subject Matter Experts Provide input to the development of the SOW. 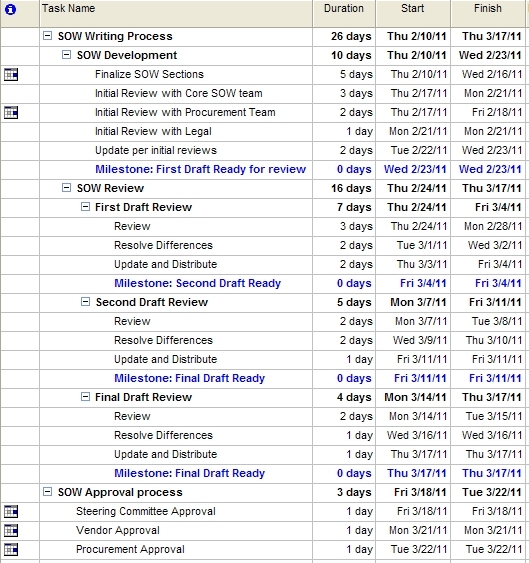 The next step is to create a milestone schedule for developing the SOW. It is important that you do this with your project team, so that everyone provides their input and owns the overall timeline and critical milestones in completing the SOW. It is critical that you get commitment (sign-off) from all the members of the SOW team. Make sure their managers/supervisors are aware of this commitment, as this will help you address delays if members of the team are pulled away by their managers to work on other “more important” projects. One of the tasks challenging you as a project manager is encouraging stakeholders to review the SOW and provide input in a timely manner. Another issue you will encounter is that people will wait until the end of the SOW writing process to give you critical feedback that you needed earlier. This tends to cause more delays, as issues that were supposed to be settled earlier are constantly being re-opened. Tip: the individuals on your SOW team will still have to do their day job, in addition to participating on the SOW team. Make sure to get their commitment to the SOW effort and adjust the SOW schedule accordingly. To avoid these delays, schedule multiple reviews at various milestones during the SOW development process. I recommend at least three reviews: an initial draft, a second draft, and a final version. This may seem like too many reviews. The benefit of this approach is that, at each review, you will get a chance to bring up and resolve issues, instead of waiting until the last moment. The other benefit is that you will have a chance to expose showstoppers as early as possible, rather than wait for them to throw up a surprising roadblock at the end. The next posts will explore each step in detail and provide tips and tricks for writing effective SOWs that keep your project out of trouble. Thank you so much for the feedback. I am glad you found this information useful. I struggled to information on writing statements of work few years ago when I had to do one for my project. This is the reason I started this series. There is a lot of grounds to cover. So much content, so little time. Thank you again and I look forward to future conversation. Please don’t hesitate if you have any questions about this or other PM topics.